Carlo Goldoni was born in 1707 into a middle-class family in Venice. As a child, he was fascinated by theatre, playing with puppets and writing his first play at the age of twelve. His father attempted to distract him from a dishonourable career in the theatre by sending him away to study at various schools, but each time Goldoni either ran away or got expelled. During one of these incidents, he joined a company of touring actors and travelled back to Venice, the adventures he experienced on this journey solidified his love of theatrical life. Eventually, in 1731, he graduated from law school and started practising in Padua. The lure of the theatre was too strong however, and the following year he was back in Venice, writing. Goldini’s path to stardom was not smooth; his first play,a tragedy called Amalasunta (1733), was a flop. He threw the manuscript in the fire, and wrote a tragicomedy, Belisario (1734), the success of which launched his career. Over the next ten years, Goldoni took up a succession of resident dramatist roles at various large theatres and opera houses, writing opera librettos and tragic works, before discovering comedy was his ideal form. His first major comedy, L’uomo di mondo (The Man of the World), premiered in 1738 and he followed it with a succession of hits, including, in 1746, Il Servitore di Due Padroni (The Servant of Two Masters). The play was written for a famous harlequin called Antonio Sacchi, (whose stage name, Truffaldino, is the servant’s name in the play) and based on an existing old plot. 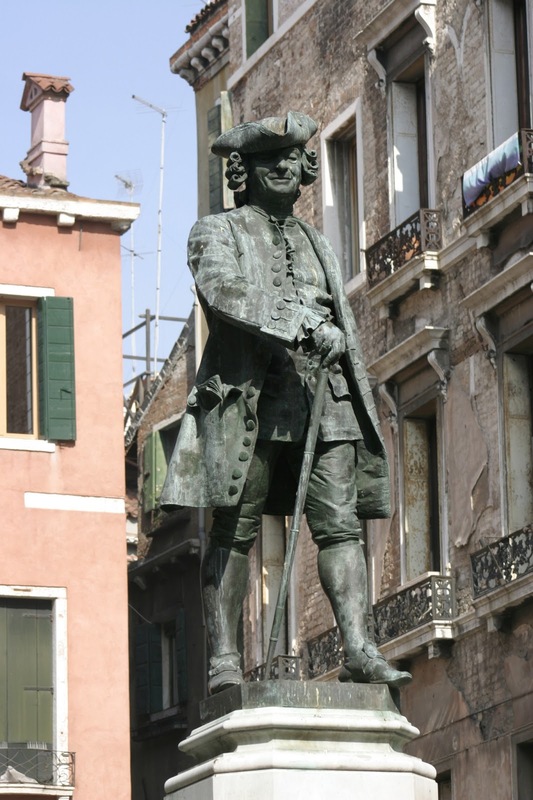 Antonio Dal Zotto’s statue of Carlo Goldoni in Venice, Italy. In 1748, Goldoni joined Girolamo Medebac’s company, who were resident at the Sant’Angelo theatre in Venice. Medebac was a famous theatrical manager who had assembled a cast of eminent actors, and Goldoni wrote a series of plays, experimenting with form and honing his skills. It was whilst he was installed with this company that Goldoni achieved his now infamous challenge of writing sixteen comedies in two seasons; a play a week. Goldoni’s relationship with Medebac deteriorated over rows about royalties, and in 1753 he defected to the Vendramin family at the rival Teatro San Luca, where he stayed until 1762. These years were dogged by a rivalry with fellow playwright, Carlo Gozzi, which played out publicly in the press and divided Venetian theatre audiences. Gozzi felt Goldoni was destroying the traditions of Commedia dell’arte and making the form banal; Goldoni, in turn, believed Gozzi’s work to be too fantastical and therefore artificial. By 1762, Goldoni was tired of the dispute and accepted an invitation to direct Italian plays at the French court of Louis XV. After his contract ended, he stayed at court to teach Italian to the royal family, and was subsequently granted a pension for life. Unfortunately, the French Revolution, interrupted these payments and Goldoni lived out the rest of his life in poverty. He died in 1793, having never returned to Venice.